51CapitalMarch.com, which organized nationwide protests in state capitals on December 11th and December 12th, has called for a grassroots, worldwide protest of the United States stolen election of 2004. All concerned citizens are urged to make or print out posters, email their networks, volunteer some time, donate some money, and help to organize local events. Christopher Hitchens, Bush Supporter, Criticizes Ohio Election in "Vanity Fair"
"If it were not for Kenyon College, I might have missed, or skipped, the whole controversy. The place is a visiting lecturer's dream, or the ideal of a campus-movie director in search of a setting. It is situated in wooded Ohio hills, in the small town of Gambier, about an hour's drive from Columbus. Its literary magazine, The Kenyon Review, was founded by John Crowe Ransom in 1939. Its alumni include Paul Newman, E. L. Doctorow, Jonathan Winters, Robert Lowell, Chief Justice William Rehnquist, and President Rutherford B. Hayes. The college's origins are Episcopalian, its students well mannered and well off and predominantly white, but it is by no means Bush-Cheney territory. Arriving to speak there a few days after the presidential election, I found that the place was still buzzing. Here's what happened in Gambier, Ohio, on decision day 2004. "The polls opened at 6:30 a.m. There were only two voting machines (push-button direct-recording electronic systems) for the entire town of 2,200 (with students). The mayor, Kirk Emmert, had called the Board of Elections 10 days earlier, saying that the number of registered voters would require more than that. (He knew, as did many others, that hundreds of students had asked to register in Ohio because it was a critical "swing" state.) The mayor's request was denied. Indeed, instead of there being extra capacity on Election Day, one of the only two machines chose to break down before lunchtime. "By the time the polls officially closed, at 7:30 that evening, the line of those waiting to vote was still way outside the Community Center and well into the parking lot. A federal judge thereupon ordered Knox County, in which Gambier is located, to comply with Ohio law, which grants the right to vote to those who have shown up in time. "Authority to Vote" cards were kindly distributed to those on line (voting is a right, not a privilege), but those on line needed more than that. By the time the 1,175 voters in the precinct had all cast their ballots, it was almost four in the morning, and many had had to wait for up to 11 hours. In the spirit of democratic carnival, pizzas and canned drinks and guitarists were on hand to improve the shining moment. TV crews showed up, and the young Americans all acted as if they had been cast by Frank Capra: cheerful and good-humored, letting older voters get to the front, catching up on laptop essays, many voting for the first time and all convinced that a long and cold wait was a small price to pay. Typical was Pippa White, who said that "even after eight hours and 15 minutes I still had energy. It lets you know how worth it this is." Heartwarming, until you think about it. "The students of Kenyon had one advantage, and they made one mistake. Their advantage was that their president, S. Georgia Nugent, told them that they could be excused from class for voting. Their mistake was to reject the paper ballots that were offered to them late in the evening, after attorneys from the Ohio Democratic Party had filed suit to speed up the voting process in this way. The ballots were being handed out (later to be counted by machine under the supervision of Knox County's Democratic and Republican chairs) when someone yelled through the window of the Community Center, "Don't use the paper ballots! The Republicans are going to appeal it and it won't count!" After that, the majority chose to stick with the machines. "Across the rest of Ohio, the Capra theme was not so noticeable. Reporters and eyewitnesses told of voters who had given up after humiliating or frustrating waits, and who often cited the unwillingness of their employers to accept voting as an excuse for lateness or absence. In some way or another, these bottlenecks had a tendency to occur in working-class and, shall we just say, nonwhite precincts. So did many disputes about "provisional" ballots, the sort that are handed out when a voter can prove his or her identity but not his or her registration at that polling place. These glitches might all be attributable to inefficiency or incompetence (though Gambier had higher turnouts and much shorter lines in 1992 and 1996). Inefficiency and incompetence could also explain the other oddities of the Ohio process—from machines that redirected votes from one column to the other to machines that recorded amazing tallies for unknown fringe candidates, to machines that apparently showed that voters who waited for a long time still somehow failed to register a vote at the top of the ticket for any candidate for the presidency of these United States. "However, for any of that last category of anomaly to be explained, one would need either a voter-verified paper trail of ballots that could be tested against the performance of the machines or a court order that would allow inspection of the machines themselves. The first of these does not exist, and the second has not yet been granted. "I don't know who it was who shouted idiotically to voters not to trust the paper ballots in Gambier, but I do know a lot of people who are convinced that there was dirty work at the crossroads in the Ohio vote. Some of these people are known to me as nutbags and paranoids of the first water, people whose grassy-knoll minds can simply cancel or deny any objective reasons for a high Republican turnout. (Here's how I know some of these people: In November 1999, I wrote a column calling for international observers to monitor the then upcoming presidential election. I was concerned about restrictive ballot-access laws, illegal slush funds, denial of access to media for independents, and abuse of the state laws that banned "felons" from voting. At the end, I managed to mention the official disenfranchisement of voters in my hometown of Washington, D.C., and the questionable "reliability or integrity" of the new voting-machine technology. I've had all these wacko friends ever since.) But here are some of the non-wacko reasons to revisit the Ohio election. "In 11 other counties, the same Democratic judicial nominee, C. Ellen Connally, managed to outpoll the Democratic presidential and vice-presidential nominees by hundreds and sometimes thousands of votes. So maybe we have a barn-burning, charismatic future candidate on our hands, and Ms. Connally is a force to be reckoned with on a national scale. Or is it perhaps a trick of the Ohio atmosphere? There do seem to be a lot of eccentrics in the state. In Cuyahoga County, which includes the city of Cleveland, two largely black precincts on the East Side voted like this. In Precinct 4F: Kerry, 290; Bush, 21; Peroutka, 215. In Precinct 4N: Kerry, 318; Bush, 11; Badnarik, 163. Mr. Peroutka and Mr. Badnarik are, respectively, the presidential candidates of the Constitution and Libertarian Parties. In addition to this eminence, they also possess distinctive (but not particularly African-American-sounding) names. In 2000, Ralph Nader's best year, the total vote received in Precinct 4F by all third-party candidates combined was eight. "In Montgomery County, two precincts recorded a combined undervote of almost 6,000. This is to say that that many people waited to vote but, when their turn came, had no opinion on who should be the president, voting only for lesser offices. In these two precincts alone, that number represents an undervote of 25 percent, in a county where undervoting averages out at just 2 percent. Democratic precincts had 75 percent more undervotes than Republican ones. "NEWARK -- A former Licking County judicial candidate said he will take his election-dispute case to the Ohio Supreme Court after it was dismissed by an appeals court Tuesday. "After nearly four months of legal wrangling over the result of the Nov. 2 election for Licking County Domestic Relations Judge, losing candidate Paul Harmon had his election petition dismissed Tuesday in the Ohio Fifth District Court of Appeals in Canton by a three-judge panel helmed by Judge Sheila Farmer. "Harmon said he intends to appeal to the Ohio Supreme Court. "It's the wrong decision," Harmon said. "The court wasn't really interested in the issues. ... Frankly, I don't have any doubt that the election results are uncertain." For the complete text of the Advocate article go to: http://nl.newsbank.com/nl-search/we/Archives? NVRI continues to press the state of Ohio to do the right thing, and conduct a consistent and fair recount. The announced winner of the campaign is obviously not an issue. But the justness of American democracy has still not been shown. Earlier this week, the Kerry-Edwards Campaign filed documents with the federal district court in Ohio, supporting NVRI's motion to have a hearing on the inconsistent standards used in the recount. The Kerry Edwards filing is mentioned below, and here are the most recent developments in this case. On February 11, 2005, on behalf of our clients David Cobb and Michael Badnarik, NVRI filed a motion for a hearing before the Federal District Court on previously filed claims regarding inconsistent and inequitable recount procedures. The earlier filings had claimed that the recount of the 2004 presidential vote had been conducted with inconsistent standards throughout the state, in violation of the equal protection and due process guarantees under the US Constitution. On February 14, Judge Sargus issued an order granting our motion to dismiss the Delaware County Board of Elections' complaint (which had sought to prevent the recount in that county) and asking for briefing in 15 days on the question of whether the case should be transferred to Judge Carr in Toledo (for the Northern District of Ohio) where a prior case seeking to expedite the recount had been filed in November 2004. And on February 24, the Kerry-Edwards Campaign filed a document in support of that statement. Most significant, the Kerry-Edwards Campaign also filed a separate document in support of our motion for hearing with two critical attachments: 1) a declaration from Kerry-Edwards attorney Don McTigue (http://www.nvri.org/updates/kerry_edwards_mctigue_decl_022405.pdf) regarding a survey he conducted of Kerry-Edwards county recount coordinators; 2) a summary chart of the results of that survey (http://www.nvri.org/updates/kerry_edwards_summary_chart_022405.pdf), which highlight the inconsistent standards applied during the recount. Attached are these two critical Kerry-Edwards filings. Once again, thanks for all of your support. Our work continues. All Americans should be concerned about the unconstitutional manner this recount was conducted. Cobb and Badnarik have filed papers requesting the court not to transfer venue of the case. We have learned that Paul D. Harmon, an independent candidate for Domestic Relations Court Judge in Licking County, Ohio, filed a criminal complaint against Licking County election officials on February 18th. The complaint, based on events in a Licking County race in which there were more "no votes" than votes cast for any candidate, accuses the officials of fraud involving "votomatic" punch card votes, of perjury, of destroying evidence, tampering with records, thwarting the administration of the recount laws, destruction of the secrecy of, and tampering with, absentee ballots, and other similar misconduct. Mr. Harmon, a Newark, Ohio, attorney, and native of Granville, Ohio, lost by 200 votes. Of the 78,000 votes cast, the Republican candidate received 14,300, and Mr. Harmon 14,100. 18,000 votes were never counted. During and after the ensuing mandatory recount, Licking County officials illegally refused to permit recount witnesses to view the uncounted ballots, or to inspect the machines, and on more than one occasion misrepresented the number of voting machines that had been used. They have also admitted that blank ballots were stored in unsecured facilites. It has also been learned that, although in one or more Democratic precincts voters were subjected to waits of 4 hours or more in order to vote, 50 unused voting machines had been kept 'in reserve' by the Republican director and deputy director of the Licking County Board of elections. It is anticipated that an independent prosecutor will be appointed to investigate the complaint. As we obtain more details of the Licking County incidents, documents, and court proceedings, this post will be updated and expanded. Columbus, Ohio - The federal Election Assistance Commission (EAC) traveled here for its first out-of-town public hearing in 2005, where the Moritz School of Law at Ohio State University hosted a packed house for nearly four hours of at times testy testimony about provisional ballots. EAC chair Gracia Hillman prefaced the afternoon hearing (a public meeting on voting machine standards was held in the morning) by emphasizing that the Commission had come to Columbus to focus on the national picture, not just Ohio. Initially, however, Ohio and its handling of provisional ballots took center stage. After being chastised by some election groups for not making appearances at Congressional hearings in Washington D.C., Ohio Secretary of State J. Kenneth Blackwell spoke about the state’s "mature" system of provisional voting that has been in place for ten years. "Ohio's provisional balloting system can stand as a model for other states," he stated. "Ohio's provisional voting system is not a model for the nation," countered Cuyahoga County, Ohio elections director Michael Vu. Vu cited late directives concerning these ballots issued by the secretary of state’s office that added to confusion for both poll workers and voters. Audience member and Lake County election director Janet Clair was also troubled at times by the poor communication between the secretary’s office and local officials. “I often heard about the directives from the media first,” Clair stated. The U.S. Election Assistance Commission, which conducted a single "public hearing" on provisional voting, has announced that it will only conduct one more such hearing before making its final "guidance" to the "elections community". "I went along with Phil Fry, as representatives from CASE-OHIO. be a model. (Mr Vu was the only panelist that was applauded). follow-up mechanism to turn a provisional vote into a regular vote. and attempt to work with them." "Public" hearing not open to the "Public"
With Lynn Landes, Jonathan Simon, Medea Benjamin, Larry Bensky, Butch Wing, Emily Levy, Jim March (Black BoxVoting), Kathy Dopp (US Count Votes), John Gideon, (VotersUnite! ), Bob Kibrick, (VerifiedVoting) and many more! DVD excerpt: Rev. Jesse Jackson, Sr., "Martyrs of the Civil Rights Movement"
Lynn Landes, journalist, "How America Used to Vote"
John Gideon, VotersUnite!, "Analysis of HAVA Misinformation in the Press"
Bob Fitrakis, Free Press (Columbus, Ohio), "The Taking of Ohio Prior to Nov. 2"
Emily Levy, Project Coordinator for Richard Hayes Phillips, Ph.D., "Ohio--How the Election was Stolen"
Warren Stewart, National Ballot Integrity Project, "Recounting New Mexico"
III. What Happened In 2004: Exit Polls - Were They Right? Jonathan Simon, Alliance for Democacy, "The Edison/Mitofsky Report: The Bottom Line You Won't Hear on Nightline"
Allyson Washburn, US Countvotes.org, "An Alternative Explanation for the Exit Poll Discrepancy: Fraudulent Vote Tallies"
Larry Bensky, KPFA, "The Disappearing Media"
Jim March, BlackBoxVoting.org, "How to Hack a Diebold Vote Tabulator"
Wayne Madsen, journalist, "The Privatization of the Vote"
Paul Lehto, Washington attorney, "Verifying Democracy 101: Sue First, Ask Questions Later"
Bob Fitrakis, Free Press, "History of Moss v. Bush, the Sanctions, Future Legal Actions"
Butch Wing, political director, Rainbow PUSH, "Rep. Jesse Jackson, Jr.'s Constitutional Amendment Guaranteeing the Right to Vote"
Bob Kibrick, Verifiedvoting.org, "Pending Federal Legislation for Electoral Reform"
Sharon Cornu, Alameda County Central Labor Council, "Organized Labor and Election Reform"
Medea Benjamin, Code Pink, "A Voters' Bill of Rights"
Walter Riley, community activist, "Organize County by County, Precinct by Precinct"
Lynn Landes, journalist, "A Paper Ballot is the Only Solution"
Alan Dechert, Open Voting Consortium, "Open Source Code Machines"
Kathy Dopp and Allyson Washburn, UScountvotes.org, "A Plan to Restore Democratic Elections by 2006"
and the MMOB (Mainstreet Moms Operation Blue), http://www.themmob.com. Election Reform Teach-In, with Blair Bobier, Bev Harris, Bob Fitrakis & Others. Sun. Feb. 27th. 2:00 P.M.
Blackwell Fails to Show Up at House Administration Committee; Chair Says "You Can Run, But You Can't Hide"
Secretary of State J. Kenneth Blackwell failed to attend the House Administration Committee Meeting in Washington DC. Chairman Bob Ney (R-Ohio) said "you can run, but you can't hide". On February 14th, Congressman John Conyers, Jr., Senator Russ Feingold, and 17 other Congresspersons filed an amicus curiae brief in the Ohio election contest suit, in opposition to the sanctions motion brought by Ohio attorney general Petro. "The attorneys in this case had reason to believe that the election results did not reflect the will of the electorate. In good faith, they brought a case based not only on statistical probability but the depositions and affidavits of computer experts, statisticians, and election volunteers. In only a couple months, these attorneys have amassed over 900 pages of evidence. "While we take no opinion on the underlying case, we firmly support the right of citizens to challenge elections results in court when they have a good faith basis to do so. Truly, Secretary Blackwell's attempt to sanction these attorneys is meant to send a message to anyone who dare challenge his questionable election administration. For our democracy to work properly, we can't allow this sort of intimidation by state officials." Public Hearing on Provisional Voting, to take place in Columbus, Ohio, February 23, 2005, at 1:00 P.M. to 5:00 P.M. Date and Time: Wednesday, February 23, 2005, 1 p.m.-5p.m. W. 12th Ave., Saxbe Auditorium, Columbus, OH 43210-1391.
successes and problems involved with the use of provisional voting. Advocacy Organizations/Non-government Sector and Academics. testimony@eac.gov, or at the meeting or via mail addressed to the U.S.
Commissioner, U.S. Election Assistance Commission. documents before the matter can be heard by a federal judge. the lawsuit filed by the presidential candidates should be dismissed. national conference and the emergence of a New Voting Rights Movement. precincts for the recount as is required by state law. the national Green Party is http://www.gp.org. Lytel, David. 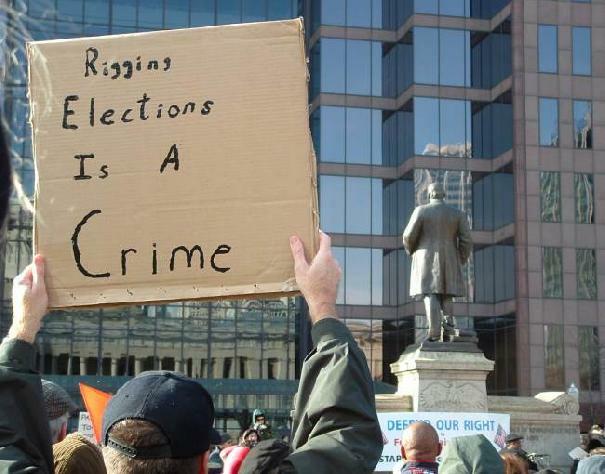 "The Honest Elections Clause of the Constitution: How to Re-Establish Legitimacy of the American Electoral Process"
DefendTheRecount.org (National Voting Rights Institute) Updates on Ohio litigation. "We are writing to ask that the Congressional Research Service, (CRS) prepare a 50 state survey of irregularities reported by the media (including internet based media) and compiled by public interest groups, non-profits and academics in the most recent election. We believe that such a study will be a vital resource to Congress as we turn from the controversies of the most recent election to the complex issue of voting reform. "Though our principal focus is on irregularities relating to the presidential election, we are also interested in learning of significant irregularities concerning other elected offices as well. We would ask that you review media reports involving irregularities and controversies in the pre-election day period (e.g, concerning registration, purging, determination of election day rules); election day (e.g., machine glitches, machine shortages, voter intimidation, ballot confusion, lack of handicapped accessible machinery, and voter misinformation); and post-election (e.g., counting provisional ballots, recount irregularities, litigation). "We are not asking that you characterize these irregularities. Rather we simply want your staff to complete the research, access the results, and divide by state and by incident. Where possible it would be helpful if you could note how the incident or irregularity was resolved. For example, was an improper purging cured? Was the cause of a machine glitch ascertained? Was the person responsible for disseminating false information pursued, is a case pending? "We are happy to work with you to develop the most efficacious means of narrowing this request, completing the research, determining the pertinent time periods to review and categories to analyze. We would note that the General Accounting Office is also reviewing the most recent election, however their review is far more narrowly focused on a small number of systemic issues. They are not attempting to survey the complete landscape of irregularities as we are requesting of CRS. "We are also willing to work with you in developing an agreeable time line for completing this important survey, although we are hopeful that it can be completed in the next several months, so that it may be as helpful as possible to the Congress as we work on voting reform." My new web site "Ohio Election 2004"
entitled "Ohio Election 2004". The URL is http://ohioelection2004.com. voter suppression, vote machine tampering, and recount obstruction. in ways other than chronologically. The Election Contest Lawyers Have Opposed the Sanctions Motion Brought Against Them by Ohio's Attorney General.